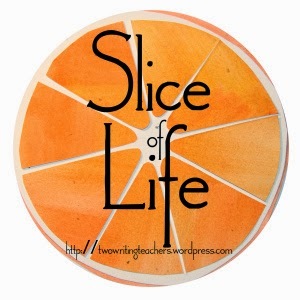 Thank you to Two Writing Teachers for hosting the March Slice of Life Challenge. Please visit their site to read other slices and leave some comment love. I LOVE, LOVE, LOVE my job as a literacy coach. There are some things that I enjoy more than others. The thing I love the most is working with teachers and kids in writing workshop. Each time I'm invited into a writing workshop, I feel like I am home. I'm happy, comfortable, and excited to be with the young writers. Today, I got to work with some amazing first graders and their wonderful teacher, Mrs. Shell. They are working on teaching books and today's lesson was all about how authors make their pictures more powerful. This author is teaching her class about how she used words to make her picture more powerful. This page is about how cats and dogs might get along and might not. She divided her page in half to show what cats and dogs would say if they weren't getting along (grrr, hiss) on one side and what they would say if they were getting along (rrruf and meow). She was very purposeful in her decisions as a writer of teaching books. This author's book is about Minecraft. I need to read all the Minecraft books I can read, because I don't know much about it. He was very purposeful about color and the way he drew the pieces to make a Minecraft person and the diamond sword. One of the special things about this classroom is that they are a community of writers. Mrs. Shell isn't the only teacher. Each and every one of them has something important to offer. I am so glad that I was invited to be a writer with them today. Lucky you! I wish our first grade teachers at my school would do workshop. I love that you have yet another way of getting your kid fix. I can relate to how you feel when invited into writing workshop - I feel the exact same way about being invited into reading workshop. It is a happy place!